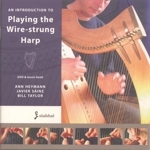 The publication of this resource is an important step for the revival of the wire-strung harp. The filmed performances offer substantial information beyond the printed page, and the possibility of repeat viewing at home provides powerful learning opportunities. The impetus for the DVD lies in the fact that very few people have a wire-strung harp teacher living locally; the danger in presenting such detail, however, is that it might appear to be prescriptive. This is not our intention, although we have tried to satisfy the needs of students who often prefer consistency over the expressive variability one would expect from a master harper. Two points should be remembered about the historical repertoire for wire-strung harp. Firstly, none of the sources was written by or for harp players, who appear to have resisted musical notation and favoured long apprenticeships, similar to those served with masters of Indian music today. It is only in collections for lute, fiddle, keyboard, bagpipe and voice that any trace of the harpers repertoire survives. Secondly, these sources are snapshots, part of the process of continuous creation, of reconstituting and transfering elements... in an imaginative way that allows a latitude, an autonomy, a play element.1 The problem of notation as a tool for preserving a decaying art, or reviving a lost one, is that it stifles the fluidity and creativity that are an oral traditions lifeblood. Students are therefore encouraged to develop their own interpretations and to view inconsistency in a positive light. The arrangements in this book are moments in time, not fixed texts to adhere to slavishly.